MACD is one of the most popular indicators for retail traders and is used in numerous charting software systems to create red sell signals and green buy signals. Unfortunately, MACD often gives false signals that result in a losing trade. Many traders struggle to understand which MACD signals are reliable and which are not, but often the distinction is not readily apparent. MACD has several key elements that are important to know if you intend to use this indicator as a primary entry signal for buying long, selling short, or options trading. Despite the fact that MACD is extremely popular with the retail crowd, empirical evidence shows that most retail traders using MACD are not consistently successful. Many are baffled by the fact that sometimes MACD works, while other times it fails completely and they endure frequent whipsaw trades that quickly wipe out small gains. Why? The first thing to understand is that MACD is a Price and Time momentum indicator. That means that the price must move before the signal can form on MACD. Therefore MACD cannot lead price as several of the quantity based indicators do. Consequently you would be entering the stock after the initial price move up or down. That can be an asset or a liability depending upon the Market Conditions and trading conditions at that time. A trading condition is the trading environment at a particular point in time, such as intraday or daily or even weekly. Market Condition is the overall type of price action that is most prevalent among the 6000+ stocks listed on the stock market exchanges. These are two entirely different conditions but work in harmony as well. As a momentum Price and Time Indicator that employs two moving averages to create the crossover signal for an entry, MACD only works optimally in Moderately Trending and Velocity Market Conditions. Velocity Market Conditions occur about 5-10% of the time and Moderately Trending occurs about 15-20% of the time. One of the reasons so many traders experience whipsaw price action when using MACD is they are attempting to use it in one of the 4 primary Market Conditions that feature sideways price action most of the time and those are Platform, Bottoming, Topping, and Trading Range Market Conditions. MACD gives false signals during Platform Market Conditions, because the tighter price action is controlled by Dark Pools who use sophisticated order processing venues that do not move price. It is contained within a narrow price zone where they have decided to buy or sell. MACD fails dismally during Platform Market Conditions which occur 40-50% of the time. That means that when Platform Market Conditions are present, MACD will cause whipsaw action and losing trades, or poor entry signals because the runs are not momentum as MACD requires. 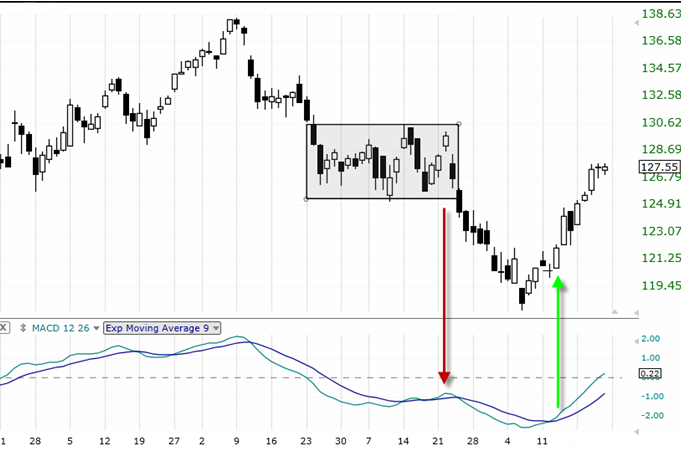 Instead is sideways action with small brief runs that do not net sufficient gains for the late entries MACD provides. See the chart example below. Remember that MACD requires that the price moves up or down before it will signal a crossover entry. If a trader attempts to use MACD during a Platform Market Condition which is sideways, the run may only last 1-2 days and will be very small price movement. This is insufficient for MACD entries which rely upon a run to continue to move several days, or sufficiently in one day for profitability. Moderately Trending markets occur somewhat more often but rarely last as long as a Platform Market Condition, which also handicaps a trader. Moderately Trending Market Conditions tend to come after a Platform Market Condition, before a Velocity Top and after a Bottom that moves up with velocity briefly. When used during a Trading Range Market Condition, MACD fails dismally. Gerald Appel did not intend MACD to be used for selling short. In addition several studies of MACD in a sell short environment concluded that it was not an ideal indicator for selling short. This is due to how price moves to the downside. It usually starts with a huge downside move on High Frequency Trading HFT activity then quickly diminishing as the stock moves down, which is just the opposite of an upside Momentum or Velocity Market Condition. The more you understand MACD and the Market Conditions in which it is designed to work optimally and those in which it fails dismally, the better you can make use of this indicator. MACD was designed during a period when the Market Condition was moving out of a Bottom with velocity, and it functions best when used in that context. However, Bottoming Market Conditions occur infrequently, and Velocity Market Conditions last the shortest length of time of all the 6 Market Conditions. So using only MACD severely limits when you can trade. Also keep in mind that as a mere Price and Time indicator, the most important data stream which is Volume is not included in MACD indications.